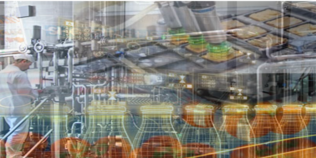 A seminar to learn from companies and technology providers on best practices to successfully implement current digital technologies into food manufacturing and to discuss policy and regulatory challenges to the uptake of such technologies within the UK Food Sector. Description: The Centre for SMART and the Internet of Food Things (IoFT) Network Plus hosted this event to provide attendees with the opportunity to learn from companies and technology providers on best practices to successfully implement current digital technologies in food manufacturing, and to discuss policy and regulatory challenges to the uptake of such technologies within the UK food sector. Outcome: The generation and dissemnintation of a briefing document based on facilitate discussions conducted throughout the day. This document will highlight how to effectively implement new technologies in food manufacturing and how to overcome the policy challenges to the adoption of these tools. The resulting briefing document will be published in June and posted on this website. 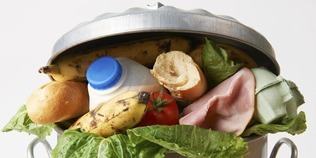 In the UK, consumers throw away £700 worth of food per family each year, which is not only a needless cost but also a source of significant negative environmental and social impacts (UK Government, 2017). Loughborough has taken a leading role in addressing this issue, with a number of local charities, (e.g. Utilise Social Café) and Loughborough University working to reduce both the occurrence of food waste and its negative impacts. However, the scale of the food waste challenge means that it cannot be tackled by researchers or local community groups alone. In response, this unique event brings together representatives from local businesses, policy makers, residents and researchers to enable them to voice their experience and concerns regarding food waste, identify what the latest challenges and enablers are and to begin the process of developing successful interventions. Stay up-to-date with the latest research including upgrading materials and valorization techniques, novel processing technologies and developments in distributed manufacture, and new approaches to sustainability and waste reduction. This free* 2 -day event will bring together industry and academic experts to discuss challenges and showcase the latest innovations in the sector. There is a Conference Dinner taking place in the Kegworth Hotel on 26th March, 7pm at a cost of £32.72 + £2.29 fee which can be booked when registering for the Conference. This is a free, one-day, event for all stakeholders interested in understanding the chemical and environmental benefits of utilising unavoidable food supply chain wastes. Food and drink is the largest manufacturing sector in the UK, employing approximately 400,000 people with a turnover of £76 billion. Food manufacturing is a complex process that is in the main linear- rather than circular-thinking. A staggering 9.9 million tonnes of food waste and food by-products are generated per year in the food industry alone, of which 56% is considered unavoidable. Unavoidable food supply chain wastes (UFSCW) lost after harvest and along the distribution and consumption chain have a dual negative environmental impact: undue pressure on natural resources and ecosystem services and pollution through food discards. However, current strategies for dealing with UFSCW are rudimentary and of low value: these include waste to energy (including incineration and anaerobic digestion), and where possible; animal feed and bedding; compositing; ploughing back in to soil; and, least preferable, landfill. This event explores UFSCW as a unique bioresource: a treasure trove of unexploited, bio-based materials and chemicals, with a range of potential commercial applications. Poster presentations are open for submission. Deadline 10th December. Please contact sophie.palmer@york.ac.uk for more detail. If you would like to sponsor or exhibit at the event, please contact sophie.palmer@york.ac.uk for more detail. The Centre for SMART will be at the 4th Annual Sustainable Food and Beverage Conference to be held November 7th 2017 in the Ricoh Arena, Coventry. This event aims to bring together key stakeholders and regulatory bodies from food and beverage manufacturers, food retailers, food service companies, the agriculture industry, ingredient manufacturers, plus key suppliers of energy, water, engineering, packaging, supply chain, logistics, emissions reduction and waste to energy technology and services. We will have a stand and a presentation on behalf of the Centre by Dr Elliot Woolley. Nottingham SciBar: How to Feed 9 Billion People in 2050? Professor Shahin Rahimifard will be speaking at the Nottingham SciBar event on 25 October 2017 on the topic of the challenges that food manufacturers face in feeding our growing population. The event will take place at the Vat and Fiddle on Queens Bridge Road in Nottingham. ‘How to do more with less?’ is a question many modern manufacturers are asking themselves. This is particularly true in the food sector due to concerns about long term availability and security of food resources. We need to change the way we grow, manufacture and consume food products to mitigate against the loss of arable land linked to climate change, the rapidly increasing global population, and changes in demand and dietary behaviours both within developed and developing countries. The unique attributes of food products such as the need for fresh perishable ingredients, health risks associated with inappropriate production environment, stringent storage and distributions requirements together with relatively short post-production shelf-life makes them considerably different to other manufactured goods. Shahin Rahimifard will look at a number of key challenges facing modern food manufacturers, including improved productivity using fewer resources, making more food with ingredients extracted from food waste, localisation of food production, and utilisation of new sustainable sources of nutrition for provision of customised food products. Dr Elliot Woolley of the Centre for SMART will be presenting next week at the Process and Packaging Machinery (PPMA) show to be held 26 - 28 September at the NEC in Birmingham on the topic of 'Energy efficient production: uncover the potential of waste'. His session will take place at 11:30 am on Thursday 28th September. It is not too late to register for this event, and registration is free. Just visit http://www.ppmashow.co.uk and we hope to see you there. This free* 2-day event will bring together industry and academic experts to discuss challenges and showcase the latest innovations in the sector. Tickets will grant you access to the full conference programme, poster show and exhibitor area. *On Thursday 30th March there will be a Conference Dinner for an additional fee of £30 per delegate. All delegates are asked to arrange their own accommodation. The Localising Food Systems conference is intended to stimulate exchange and debate about re-distributed food manufacturing, food systems, and food-energy-water nexus issues at enterprise, local and regional levels. This event will be truly multidisciplinary, with contributions from engineering, agriculture, natural sciences and social sciences. It will also encourage debate and share perspectives with business, local authorities and stakeholders in the food, energy or water sectors. The Centre for SMART will participate with posters and the unveiling of a re-distributed food manufacturing report written by SMART researcher Pedro Gimenez. 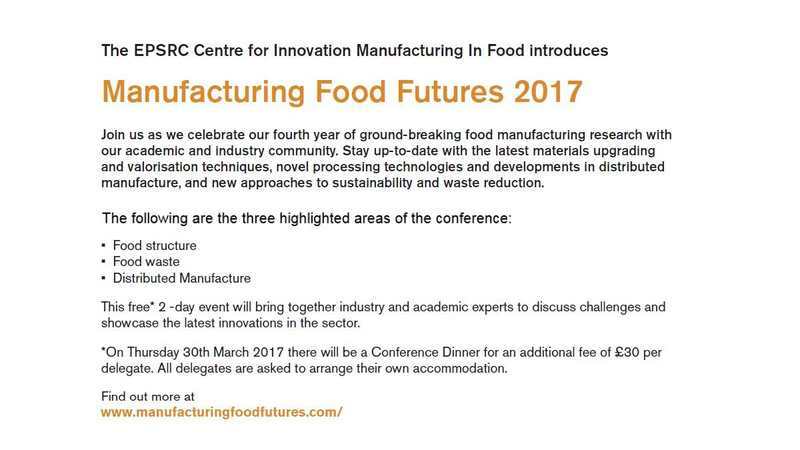 Members of the Centre for SMART will be in attendance at the Centre for Innovative Manufacturing in Food stand and look forward to meeting you. We hope to see you there: 22-24 November at Food Matters Live, ExCeL London. Share your passion for sustainability this July at our 5th annual conference. Meet future collaborators, thought leaders, inventive researchers and industry forerunners. Connect, discuss and debate at our exhibition, workshops, and pop-ups. Information including the conference programme can be found here. Register here. Tata Steel, Altro, Extremis, iema, KTN, Business.Cubed, University of Cambridge, Cranfield University, Loughborough University, Imperial College, De Montfort University and more. · Renewed energy and enthusiasm! Peter Jones, Institute of Environmental Management and Assessment - Delegate at our 2015 conference. To book your place to attend the conference, please visit the ONLINE SHOP. Just £270 for the 2-day conference on 7-8 July and dinner on 7 July at Churchill College, Cambridge. Student and one-day discounts available. High-Value Business Models Symposium on the afternoon of 6 July at the IfM, Cambridge. Book your place when registering for the conference. If not attending the conference, book through the IfM Shop here. More information about the symposium here. Pre-conference networking dinner and drinks at Madingley Hall on the evening of 6 July 2016. Book your place when registering for the conference. As part of the Sustainable Environment and Energy Systems (SEES) Graduate Program Spring 2016 Seminar Series at the Middle East Technical University - Northern Cyprus Campus, Professor Shahin Rahimifard will speak about waste management. The Seminar Series overview is here. At the SLEM Future Footwear Materials Conference internationally renowned speakers will show and talk about how to find sustainable resources, the circular economy, bioprinting, smart textiles, new ways of treating and making leather, and much more. Professor Shahin Rahimifard of the Centre for SMART will speak about “A system approach to establishing a Circular Economy in Footwear Industry”. The worldwide consumption of footwear is estimated to be in excess of 20 billion pairs of shoes per year, most of which are currently being disposed of in landfill sites around the globe. Producer-responsibility issues and forthcoming environmental legislations are expected to test the way the footwear industry deals with its end-of-life (EoL) products. Material recycling of footwear products is however a formidable problem with most modern shoes containing a complex mixture of leather, rubber, textile, polymers and metallic materials. The long-term challenges in establishing a system approach to realisation of a Circular Economy for footwear products will be discussed in his presentation. 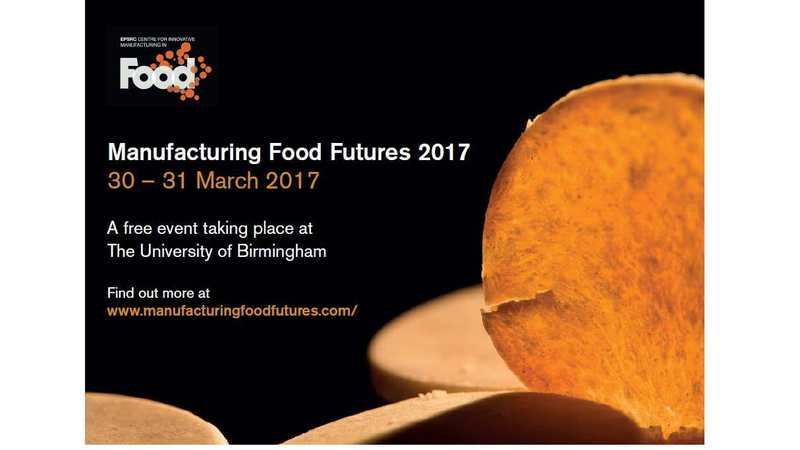 Catch a glimpse of the fascinating future of food at the annual EPSRC Centre for Innovative Manufacturing (CIM) in Food conference being held this year at Loughborough University 23-24 March 2016. The conference includes talks by guest speakers from various sectors of the food industry, as well as presentations of the cutting edge research being undertaken at the University of Nottigham, University of Birmingham, and Loughborough University. Centre for SMART members of this Food CIM will have presentations on both days. The poster presentation will include interactive exhibits such as a functional rig for the monitoring and management of water consumption in food production, interactive displays of consumer behaviour, strategies for reducing food waste, and more. Confernence talks range from novel uses of food ingredients and new processing technologies to manufacturing for healthy diets and lifestyles and sustainable supply chain and waste management. Whether you are an industry professional or simply interested in learning more about the food we will eat, you are sure to find something to engage you. SMART researcher Miss Tegan Pringle will be giving a guest lecture to students in the BA programme in Footwear Design at De Montfort University (DMU) in Leicester on Wednesday 9th March 2016. Footwear Design at DMU covers the unique and complex shoe design process emphasising the crucial relationship between design and manufacture and the needs of the footwear industry. Tegan is a 2nd year doctoral researcher in the area of zero waste in manufacturing with direct studies on footwear and leather recycling. Members of the Centre for SMART will be running the Your Business Future workshop as part of the Your Green Future Event at Solihull College Conference Centre on Wednesday 2nd and Thursday 3rd March 2016. 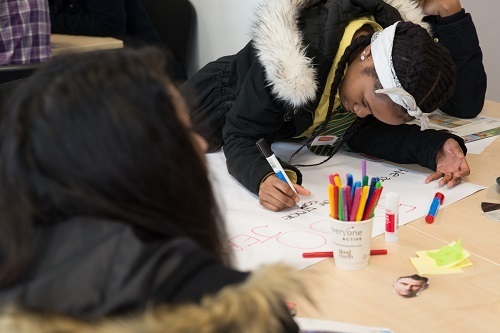 The event is designed to engage school students with a more sustainable economy, and their potential role in creating this through their career choices. It is open to schools across Solihull and Birmingham and free! You can sign up using the online form on the yourgreenfurutre.org.uk website. At the event students will have the opportunity to work alongside over 25 businesses. Together they will address a series of creative challenges. Students will also spend time in the Career Pathways Exhibition. The Your Business Future workshop of the SMART team will engage students’ creative side in developing a retail item of today (e.g. food, fashion, cosmetics) into a product fit for 2025. Working with successful businesses the teams will future proof their product - overcoming shifting consumer trends, resource scarcity, increased regulations and anything else the changing climate may throw at them. Each team will enter their product into the Future Retail Awards, and vote for the most sustainable entry, in terms of people, planet and profit. Overall, students will gain an understanding of the choices, the opportunities and the challenges of putting environmental, social and economic sustainability at the core of business.